thick,nice rug and beautiful colors. Sheds a little bit at first. Safavieh Handmade Soho Burst Rust New Zealand Wool Rug - 3'-6" X 5'-6"
This beautiful Swirl rug is styled with a modern gradient in rich shades of red, orange, gold and beige. Hand-tufted in India using plush wool, this elegantly designed rug will add luxurious personalization to any room. This rug is high quality and high density, perfect for our household. I do wish that the colors had been more vibrant, but never the less it looks very nice and will likely last a long, long time. Looks like a painting on the floor in my living room. Soft and plush rug. Excellent quality. Great price. Color is nice but after all this time it is still shedding. "Is this rug closer to orange or closer to red?" Hello bjdd44, the primary color is red. It has gold, beige and orange accent colors. Thank you for shopping with us! 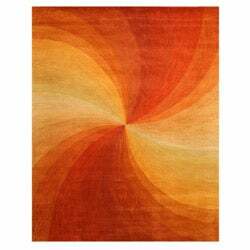 Safavieh Handmade Soho Burst Rust New Zealand Wool Rug - 7'-6" X 9'-6"